Her name is Dolores Erickson and she has been living in the Seattle for around 40 years, after a career that included being an Eileen Ford model in New York. 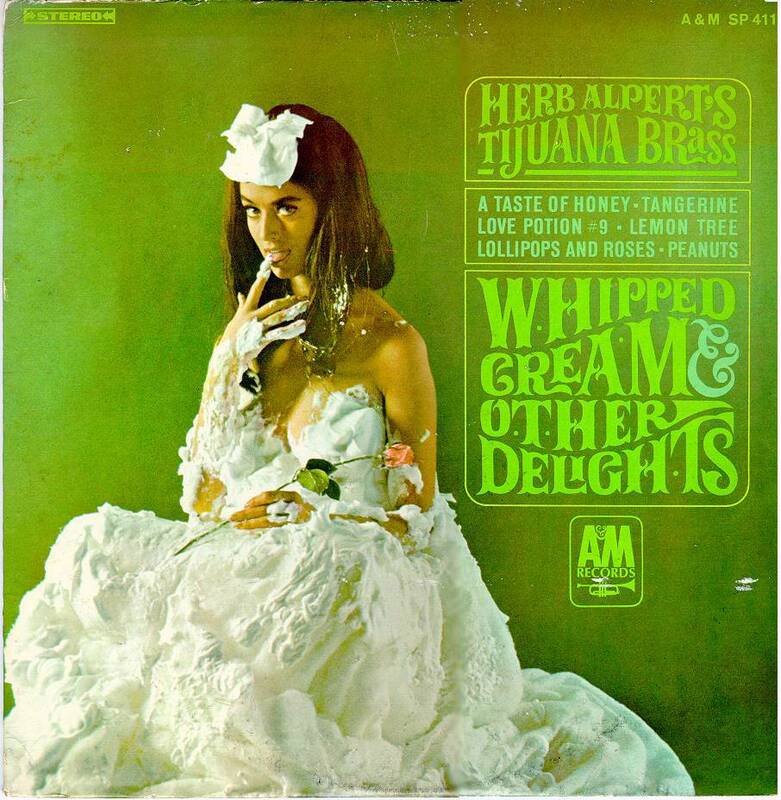 You don’t know her by name — maybe as the “Whipped Cream Lady” — but certainly by the album cover on which she is featured: the 1965 Herb Alpert & the Tijuana Brass‘ Whipped Cream & Other Delights. There she is, seemingly naked but covered in what is supposed to be whipping cream looking at YOU. Whenever a list of the most memorable record covers is put together, that album is right at the top. How did a 2006 New Yorker magazine article explain the impact of that photo? For Erickson, the photo shoot was one of many in her career. Her modeling began when she was 14 and won a contest at the venerable Frederick & Nelson department store in downtown Seattle, Washington. Her modeling career blossomed, and she ended up a staff model for Macy’s in San Francisco, in the days when department stores could afford such things. Erickson spent time in Los Angeles, signed to contracts by Paramount and then Warner Bros., but her movie and TV career mostly consisted of bit parts. At age 24, she went to New York City and ended up being signed by Eileen Ford. She was in ads for Max Factor and was in all the women’s magazines. Erickson is 5 feet 7, with dark brown hair and green eyes, and still weighs about the same as in the modeling days, which is around 119 pounds. But she’s cognizant of time having gone by. “Please don’t do any close-ups,” she tells a photographer. In 1965, she got a call to fly to Los Angeles for a photo shoot for A & M, a new label started by Herb Alpert and Jerry Moss. The photographer was Peter Whorf, with whom she had done other covers. Payment would be around $1,500 ($11,000 in today’s dollars), plus expenses. The shoot began midmorning and lasted through the afternoon. Erickson put on a bikini, but with the straps down. She was 29 and three months pregnant. “But I wasn’t showing,” she says. Erickson sat on a stool and from the waist down, Whorf placed on her a white Christmas tree blanket. Then shaving cream was sprayed on Erickson. 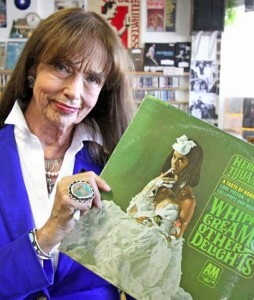 Under the bright lights, whipping cream would melt, although it was real whipping on top of her head. The shoot kept going, Erickson remembers, and she didn’t notice that the shaving cream kept slipping down. Months later, Whorf mailed her two outtakes. “He sent them to shock me. And it did shock me. I screamed,” says Erickson. “I was a Christian girl.” Erickson has kept a copy of one of the outtakes, and it is a bit more revealing, but not by that much. But she worried that her then-husband, a New York shoe manufacturer, and “conservative,” would become upset. She hid the two photos behind the refrigerator at a girlfriend’s home. Later, she’d tear up the photo she deemed the most revealing. In the mid-70s, raising a young son, Erickson moved to Longview, Wa. to be near her sister, and for years, ran an art studio. By 2012 standards, that album cover is demure. Yet it endures. Teen dreams. “I looked at it as being an ice cream sundae,” Erickson says. “As far as I’m concerned, I’m very young. I don’t take pills. I have lots of energy. I’m lucky and I enjoy being alive.